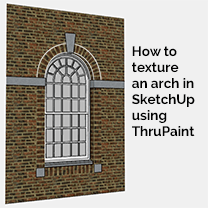 In this tutorial you will learn to use Fredo's ThruPaint to texture an arch using it's QuadMesh UV feature. This technique is particularly useful for Architectural models that require you to reflect the real world construction using only a texture. Before you start you will need to install both Fredo Tools 2.9 and LibFredo 6.9 into SketchUp. If you use our ExtensionStore you can install these directly into SketchUp in a few clicks. Once installed you can access ThruPaint via Tools > FredoTools > ThruPaint or via the FredoTools toolbar. 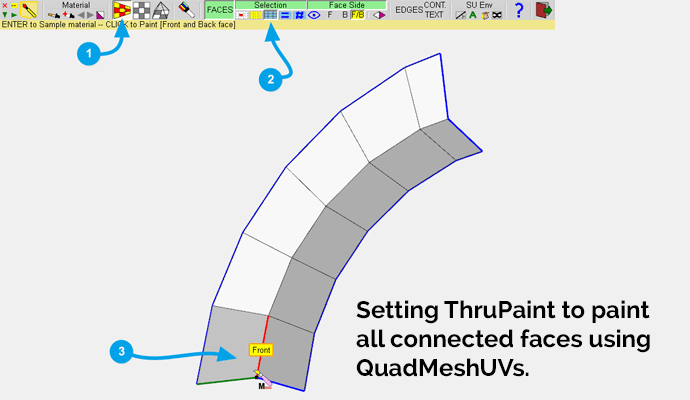 To add a dedicated ThruPaint icon to SketchUp go to Tools > FrdeoTools > Default Parameters and under Icons visible in the toolbar select ThruPaint. Next time you start SketchUp you will see the icon. 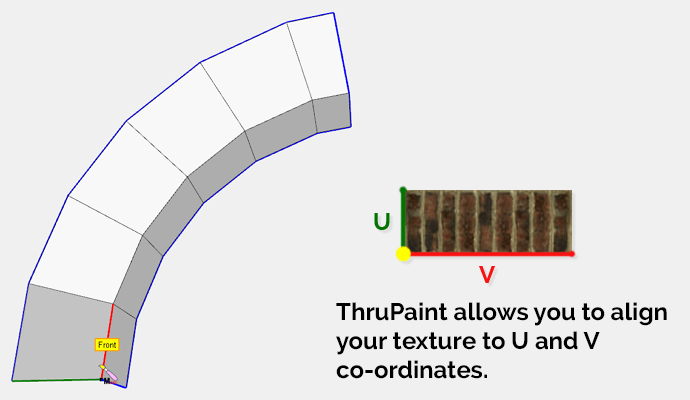 To begin you will need your geometry to be compliant with ThruPaint QuadMesh UV method. 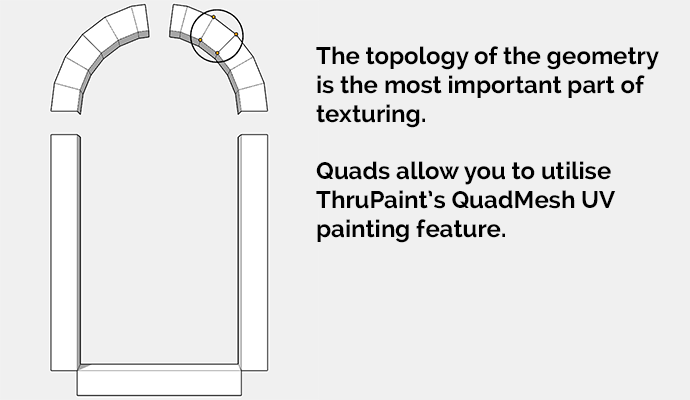 Every face of the arch must be a quad for ThruPaint to apply the texture correctly. Below is an example of a mesh constructed taking Quads into consideration. When you activate ThruPaint the on screen options need to be set to paint your mesh correctly. Below you can see that ThruPaint is set to paint QuadMesh UVs and All Connected Faces. If you hover over a face in SketchUp you can see ThruPaint highlight one edge Green and the other Red. This is important because this is related to the orientation of your texture. For this example I tweaked the SketchUp Red Brick texture in PhotoShop to reflect the construction method and appearance. To align the texture correctly we need to pay attention the the U and V direction for the texture as shown below. Paint your texture and because we chose All Connected Faces ThruPaint will align the texture correctly. If you need the manipulate the texture further you can click the surface again to enter Visual Edit mode. 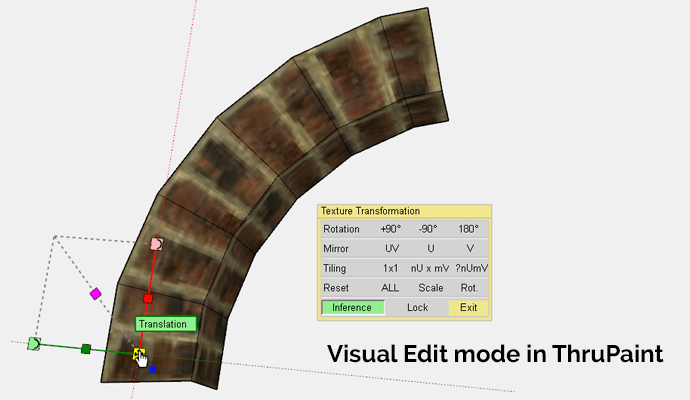 The Visual Editor of ThruPaint allows you to scale, rotate and translate textures interactively in SketchUp by dragging on the appropriate handle. As you can see the final result is a perfectly textured arch in SketchUp. 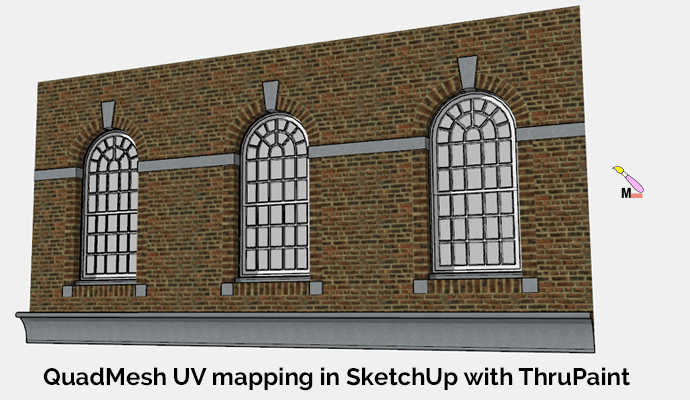 ThruPaint is an excellent texture mapping tool for SketchUp that is relatively easy to use.